Photo: Courtesy of Hester Street Fair. At the risk of sounding a little cheesy, New York City this week is all about inspiration and discovery. Sure, sure, when is the Big Apple not about those things? But, the upcoming days in particular are packed with back-to-back enlightenment. From street fairs to art shows, this week is filled with serious inspiration. It all begins with getting your mind and body in the right state. Majorly discounted treatments are available all week long at luxurious spas, including Jurlique, Elizabeth Arden's Red Door Spa, Fresh, and more. Feel relaxed and refreshed without breaking the bank. Inspired yet? When: Monday, April 21 to Sunday, April 27. New York Live Arts' James Baldwin: This Time! Where: New York Live Arts Theater, 129 West 19th Street (between Seventh and Eighth avenues); 212-924-0077. The boutique's name says it all. The newly opened Meatpacking store is the physical representation of co-founders Tanya Sheikh and Ivan Gilkes' charitable spirit. In Support Of showcases the work of talented designers while supporting worthy causes around the world. When: Thursday, April 24, 6 to 9 p.m.
Where: In Support Of, 342 West 13th Street (between Hudson Street and Eighth Avenue); no phone. Tickets: Free. RSVP here by Wednesday, April 23. With co-hosts Arianna Huffington and Mika Brzezinski, and a speaker lineup that includes Julianne Moore, Tory Burch, Katie Couric, Cindi Leive, and many more, this two-day conference is a hotbed of inspiration. Join the conversation to find out how this impressive cast decided to switch its perspective and start measuring success using metrics other than money and power. When: Thursday, April 24 to Friday, April 25. Where: New York City Center, 131 West 55th Street (between Sixth and Seventh avenues); 212-581-1212. Few things get us more excited about spring than the prospect of spending the morning afternoon entire weekend uncovering vintage finds, snacking on local food, and strolling in the sun. At this open-air fair, now in its fifth season, we get to do all three at the same time. 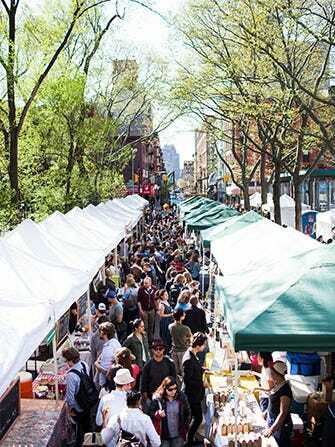 When: Saturdays and Sundays from Saturday, April 26 to Sunday, October 26, 11 a.m. to 6 p.m.
Where: Corner of Hester and Essex streets.